Please note - the closing date has been extended to 11th January 2017 to allow for any Christmas postal delays. At its meeting on 22nd September the Parish Council received notice from the Clerk that she wishes to retire at the end of the current financial year - 31st March 2017. The Parish Council Buxworth Christmas Tree Lights Switch On will be held at 6.30pm on Friday 2nd December 2016 at Buxworth School. There will be Carols, accompanied by members of Whaley Bridge Band, and Prayers outside around the tree. The Chinley, Buxworth and Brownside Community Association, working closely with the Parish Council, are developing outline plans for the site on Lower Lane, Chinley. This follows the Community Vision consultation process in 2015. The Community Centre Website has More information available with links to the consultation document and survey. Chinley, Buxworth and Brownside Parish Council has applied to High Peak Borough Council for designation of the parish as a Neighbourhood Area. This is the first step towards preparation of a Community Right to Build Order to replace the Community Centre at Lower Lane, Chinley. Unfortunately this event has now been held, but this item includes very useful information for any bike owner who may have missed it. Cyclists in Chapel and Chinley were invited to get their security in to gear as part of a crime prevention and property marking drive on Saturday 21st May 2016. Derbyshire County Council is currently consulting about its difficult decisions to make savings with proposals for changes to subsidised bus services. You may wish to make a response by filling in the questionnaire on-line at www.derbyshire.gov.uk/transportchanges or by printing a copy from the document below and returning it to the County Council either directly or through a library. Do you want better, faster broadband for your home or business? 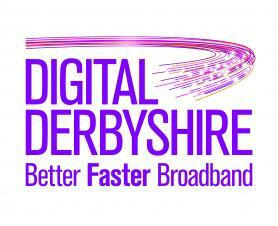 Digital Derbyshire is a £34 million partnership between Derbyshire County Council, Broadband Delivery UK, BT, D2N2 Local Enterprise Partnership and the European Regional Development Fund to bring fibre broadband to more than 100,000 premises across the county. Wayfarer Tickets are now available from Northern Rail conductors on Hope Valley Line trains. XHTML 1.0 validated. WCAG compliant. Page generated in 0.1482 seconds.